Blessed by a scenic harbor and adorned with colorful houses; Portovenere is one of the Italian Riviera’s most talked about villages. This lovely village is ideally perched at the edge of a rocky promontory, overlooking a strait. Portovenere’s old buildings and narrow streets complete its medieval appeal. It is known for its rich culture and traditional way of life. Its inhabitants are also applauded for maintaining a harmonious relationship with the natural landscape. These are just some of the reasons why, together with Cinque Terre and the whole eastern Ligurian Riviera; the village is hailed a UNESCO World Heritage Site. Portovenere’s layout looks like it was always meant to be a tourism town. As you walk through its main street called Via Capellini, you will be greeted by a series of shops and restaurants. The Pietro Church is one of the most important historical sites in Portovenere and the church’s origins go back all the way to the 6th century. During the 13th century, a bell tower and Gothic-designed sections were added to it. Another religious building you should explore is the 12th century Church of San Lorenzo, with its impressive Romanesque facade. 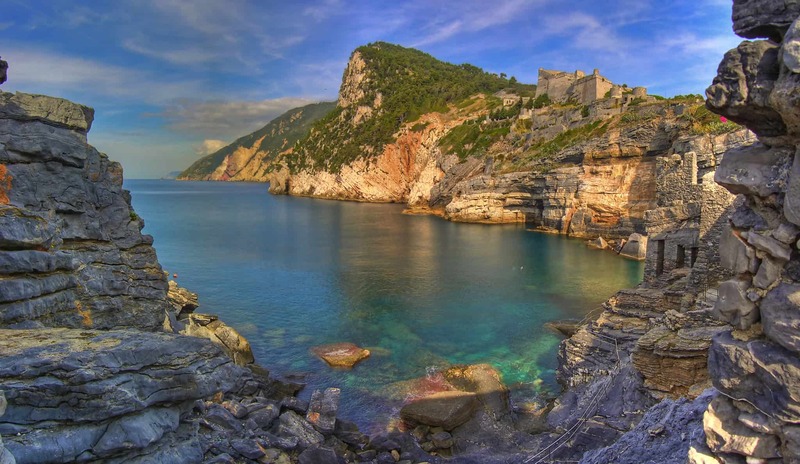 Lastly, you cannot leave Portovenere without dropping by the Doria Castle. Built between the 12th and 17th centuries; the castle has become the village’s iconic landmark. Visitors to the village usually go for a leisurely walk up the hill, where the castle is nestled. This grand fortress opens its doors during summer. This is also the period when it hosts a number of art exhibits. Another lovely walking spot is the promenade along the harbor. Here, you don’t have to worry about competing with vehicles as the entire area is for pedestrians only. You can take your time and admire the colorful homes that line the promenade. If you go all the way to the other side, you will come across Byron’s Cave. It is possible to swim near the coast, but there are no sandy beaches. Fortunately, you can easily head out to the nearby island of Palmaria to satisfy your desire for sandy stretches. Palmaria is the largest of the three islands situated just across the strait. There are several excursion boats that are scheduled to bring tourists to these islands from Portovenere every day. So, you do not have to worry about finding a way to make it to Palmaria, Tino and Tinetto. Aside from having nice beaches, Palamaria’s main attractions include the Blue Grotto and the cave named Grotta dei Colombi. Although, they are both military zones, Tino and Tenetto are the homes of an 11th century abbey and a 6th century monastery respectively. 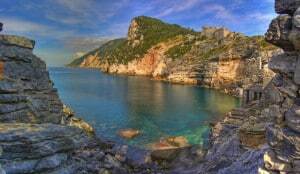 You can find Portovenere in a peninsula famously called the Gulf of Poets. This is actually a section of the Gulf of La Spezia, and has earned its name in reference to the famous writers like DH Lawrence, Byron and Shelly, who frequently visited it during the 19th century. From Cinque Terre La Spezia or Lerici; you can reach the village by ferry service, which operates along the Italian coast. Other alternatives include taking a bus from La Spezia or driving on the narrow road from A12 autostrada. But take note that during the summer, parking spacse can get filled up very easily.